Spotted off of Maine's Mount Desert Island, from the Cranberry Island Ferry. 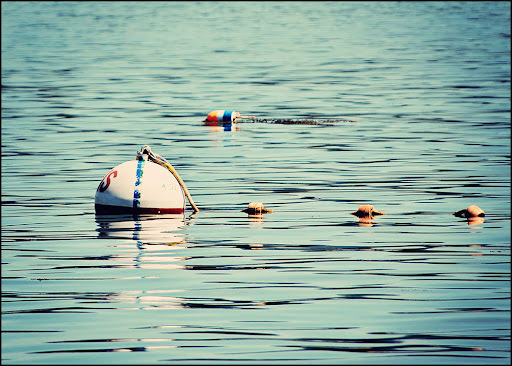 Click here to purchase Buoys from Around the Island Photography. I love this one. The relection of that stripe is perfect. So calm and seemingly still for all of the movement here. Lovely .. I can smell the sea! That is beautiful. Draws one in to the photo. I love smooth water; it makes great reflections! It looks so peaceful. I think I would like it there. Hopefully there are not any loud motor boats around to ruin the moment. I like the straight-line arrangement of the buoys in contrast to the texture of the water. Gorgeous colors and reflections that create a delicious soft texture. Nice photo. This says Maine, doesn't it? Lovely. love the water and the reflection and the tiny waves..pretty. Love the simplicity of the composition. The round light is beautiful as well. Such a serene feeling. The Maine coast is just a photographer's dream. Great shot, so peaceful. But I can't help thinking I'd love to dive in! Great shot, but does cranberry island ferry mean you get to see cranberries growing? Great colors and comp in this shot! Love it! Great water shot, lovethe colorful reflections. I love the color and the simplicity of this shot. nice job.